Hase introduced a new KettWiesel in the spring of 2007. The new KettWiesel AL has a lighter aluminum frame and lighter is always nice. The KettWiesel’s road holding, maneuverability, and stability remain unchanged. I’m enthusiastic about the available 27 speed dual-derailleur version: finally a KettWiesel with gearing for hilly territory that is not a $500 upgrade. The AL adjusts to fit a wider range of rider sizes without changing the chain length than last year’s KettWiesel’s. 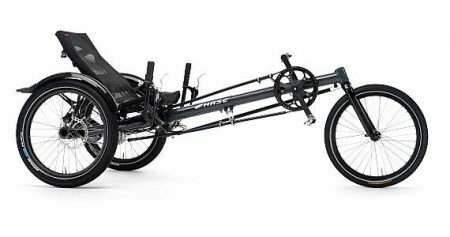 The extruded aluminum front frame has a grove that mates with a pin in the rear frame so you don’t have to think about keeping the front wheel vertical when you set it to fit your leg length. The KettWiesel AL’s seat is new too. Made from oversized aluminum tubing its recline adjustment is much easier and stays where you set it much better than the 2006 version did. To park the KettWiesel in a small space it can be stood on end. A little rubber foot protects the rear reflector (and your floor…). We typically stock the KettWiesel Al with 27 speeds; it’s hilly here in western NY. I prefer the optional Shimano Dura Ace Barcon shift levers over the Grip Shift but it is easier to mount a mirror with the Grip Shift. KettWiesel AL prices start under $3000 for the wide range 9-speed version (28 inches to 92 inches) with options you can spend hundreds more. Nexus 8-speed hub or Rohloff 14 gear hub. For great climbing traction on gravel roads, you might want the two-wheel drive option. It is quite expensive but puts more than 2/3 of your weight on drive wheels; on a tadpole, less than 1/3 of your weight is on the drive wheel. 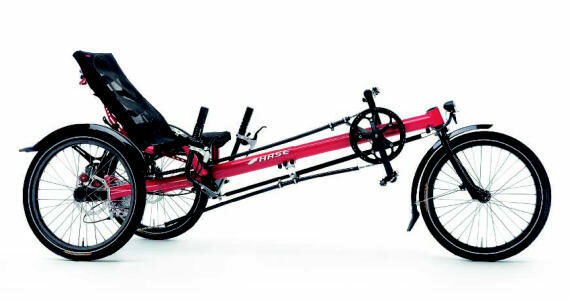 The KettWiesel AL is still the lightest & fastest delta trike on the market, it’s even faster than some tadpole trikes. It is also the only delta trike I know of that should have the rear wheel alignment re-set when the trike is adjusted for a rider of significantly different leg length. The first model year of the Kett AL we had several rear axle failures. This was due to a manufacturing problem that led to bearing miss-alignment. This has been resolved in subsequent model years. Greenspeed introduced their first delta trike, the Anura, in 2007. The Anura is several hundred dollars less expensive and comes with two wheel drive standard. The Anura is not as fast as the KettWiesel but has a higher warranty weight is more reliable and much easier to set up correctly. We stock the Greenspeed Anura and may stock a KettWiesel from time to time.